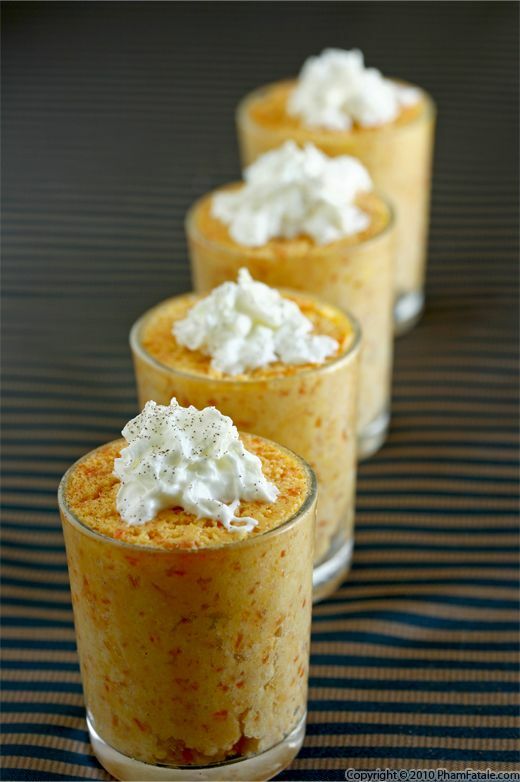 This mango carrot mousse recipe is a refreshing escape from everyday ingredients. It has an Asian flair to it because of the use of mango, ginger and cinnamon. To the mango mousse, I added shredded carrots cooked in milk and agave nectar. I purposely didn't blend the carrots with the mascarpone cheese in a food processor so there would still be a slightly coarse texture to the mousse, which I find very pleasant. Whenever I'm on a quest to make a new dessert, I always keep in mind that most people appreciate a little decadence. Serving the mousse in small verrines is a great way to keep rich desserts from becoming excessive, and it also makes the desserts more elegant. It will keep the dessert fans in your life coming back for more!